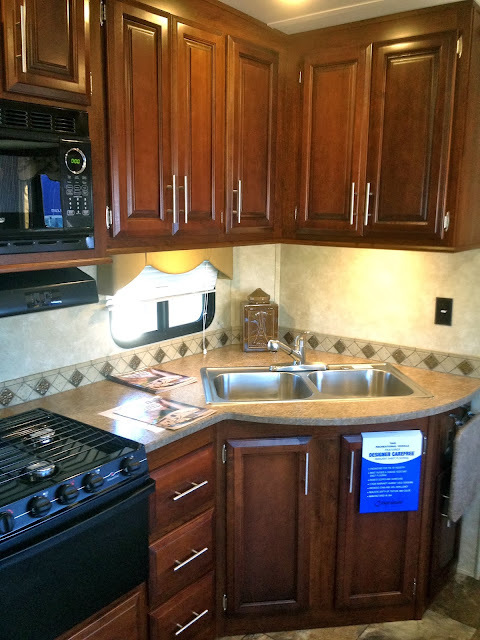 This past weekend we went to the Florida RV SuperShow put on by the Florida RV Trade Association in Tampa. 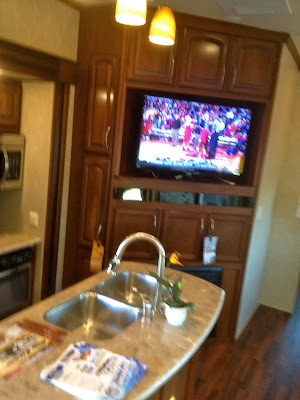 This was only our second RV show ever and it was definitely "super" sized. 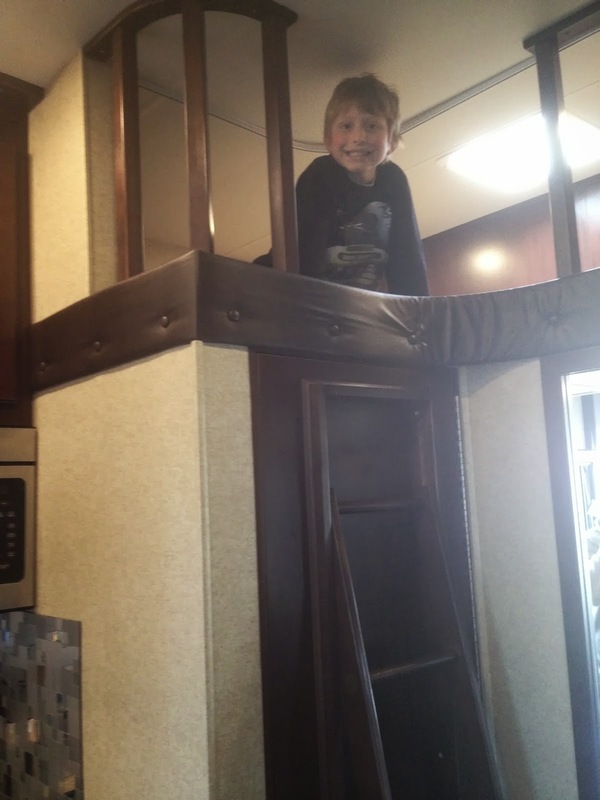 After being in our travel trailer for more than 6 months, we have a much better idea of what a family of four needs in an RV to live and work on a daily bases. Basically it boils down to more space - go figure! We checked out some new travel trailers but quickly realized if you want more storage space a fifth wheel is the way to go. Here is a smattering of units we looked at - some practical and some just for fun. 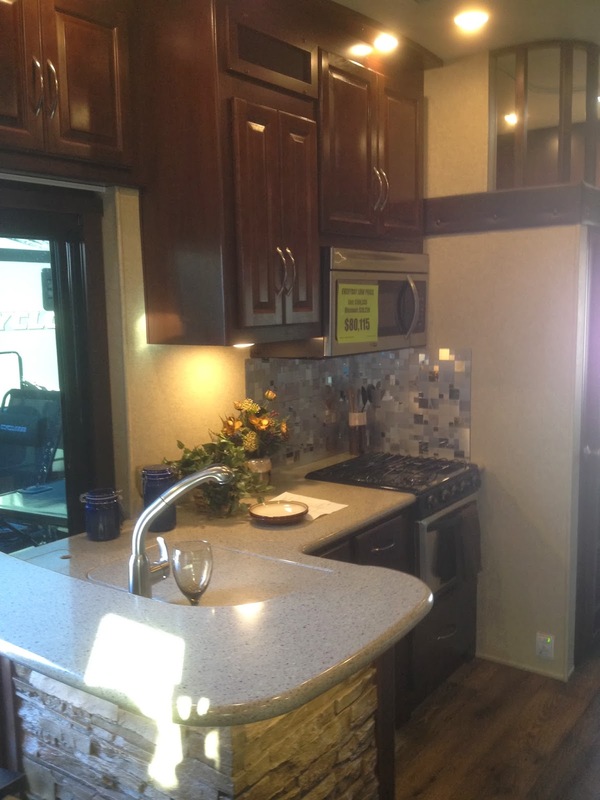 This fifth-wheel had a big bunk room for the kids and a very nice kitchen. Not to mention actual drawers for clothes in the master bedroom. I do miss those! Here is the floorplan with specifications.. One major con is the weight. We'd need a huge tow vehicle for this sucker. Look at that kitchen - especially the giant refrigerator! 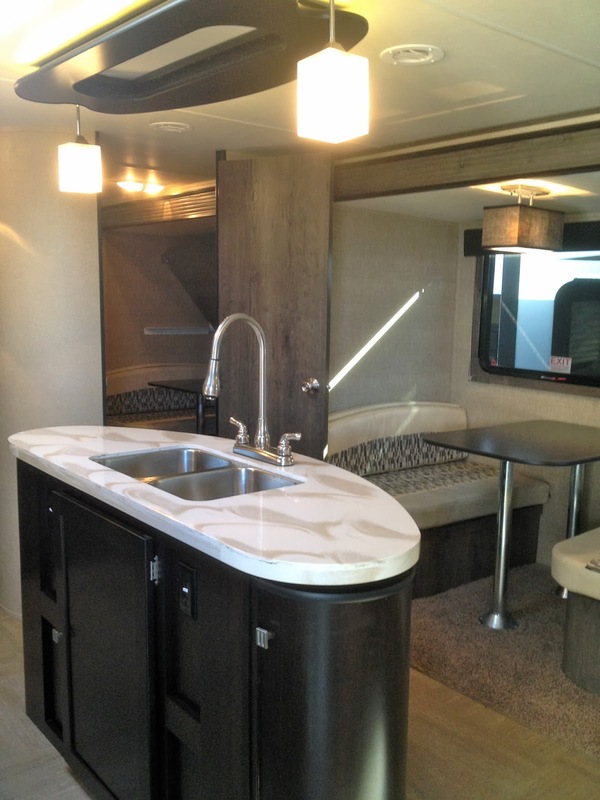 I really like the floorplan of this fifth-wheel. There is an adequate size bunk room with it's own partial bathroom. Our family of four using an itty-bitty vanity has been challenging. I didn't get a picture but the sofa in this unit was very comfy. And I love, love, love the wardrobe slide in the master bedroom. Also, this one is advertised as a half-ton towable which is very good. It weighs about 3,500 lbs less than the Brookstone model above. If we were to seriously consider another travel trailer, this Kodiak would definitely be a contender. 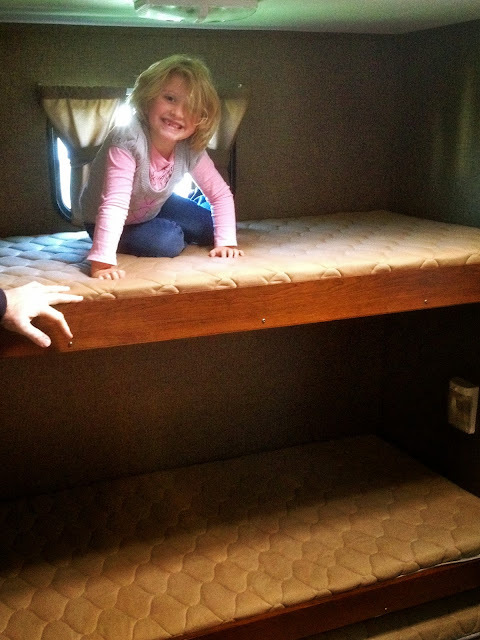 We really liked the bunk room with the dinette for homeschool and play. And the island in the kitchen area was a nice surprise. We could just about pull this one with the mid-size truck we have. But, again, no real added storage space. This was probably my favorite of the day. It wasn't the heaviest but it wasn't the lightest and no wonder considering the double sized refrigerator and normal sized shower and awesome recliners. Yes, I did fall in love with this one - lots of sighs as I walked away. The seating in this unit was so comfortable and there was so much storage in the main bedroom. And, a second partial bathroom for the kids. Look at all that comfy seating. I think this was a Cyclone Toy Hauler by Heartland but I'm not certain. Regardless, it was huge and felt like a house. There was a "garage" with bunks and a table - the back (a.k.a garage door) folds out to use as a deck or ramp as needed. The kitchen/living was plush and had a loft up above. The sliding door opened to a fold out patio which let in lots of light and added to the spaciousness. Very cool, but so not practical - for us anyway. Behind the ladder is a big pantry area. The travel trailer we have is sufficient for weekends or even a couple of weeks of camping/living and best of all it's nearly paid for? So, after six months of living in an RV, the real question for us is, "Are we going to continue this lifestyle full-time?" Just today my 7 year old son stated in frustration at having no place to put/display his LEGO creations, "For my birthday and Christmas this year, all I want is a house." And my five year old keeps asking when she can get her toys out of storage. For now, we are exploring all options as we consider our plans and living arrangements into the foreseeable future.